What can be better than BBQed ribs? Slow-cooked BBQ beef ribs under homemade barbeque sauce! These ribs are something very special, they literally fall of the bones. The taste of it – mmm… So delicious, so juicy and so saucy! Barbecue sauce – such a difficult word, but not a difficult sauce! Just take paprika, honey, soy sauce and some organic fresh tomatoes, voila – best BBQ sauce in the world! Do not forget napkins, there will be a lot of foodporn, natureporn, cooking ASMR and of course our brave Kittie Crew! Preheat the pan, grease it with oil. Fry 1kg of beef ribs slightly until golden brown from both sides. 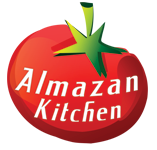 Preheat special AlmazanKitchen log stove to 248°F/120°C. Slow-grill the ribs for 5 hours. While step #3 is in the process let’s make homemade BBQ sauce. Preheat the pan, grease it with oil. Add 1 tbsp. of paprika, 1tsp. of honey – stir well and set on low fire. Add 1 tbsp. of soy sauce – stir well again. Add fresh tomato juice, stir well and slow-cook until rich saucy consistency. Brush the meat with BBQ sauce using handmade rosemary brush. Grill ribs for few more minutes so sauce can parch and soak into the meat. Best SatayBest Pesto Chicken Pasta – Extremely Tasty!